Maryadha Ramana(a small budget movie with Sunil) later he announced the project NaanEe and the hero of the movie is a "Fly".The novel idea itself created a buzz in the industry.Lets see what Kind of Buzz this NaanEe creates? The Movie starts with a child asking her father to tell a story & her father narrates her this story of NaanEe.The movie has all the cliche`s like a cold blooded Villain(Kicha Sudheep) ,a kind- hearted Hero(Naani) and a beautiful Heroine(Samantha).But what makes the movie interesting is the brilliant execution by the well experienced Raja mouli and the scintillating VFX work. Naani & samantha loves each other but Samantha pretends that she doesn't have interest in Naaani. Meanwhile Sudheep, a business man who has an eye on Samantha came to know that both Naani & Samantha loves each other and Kills Naani. 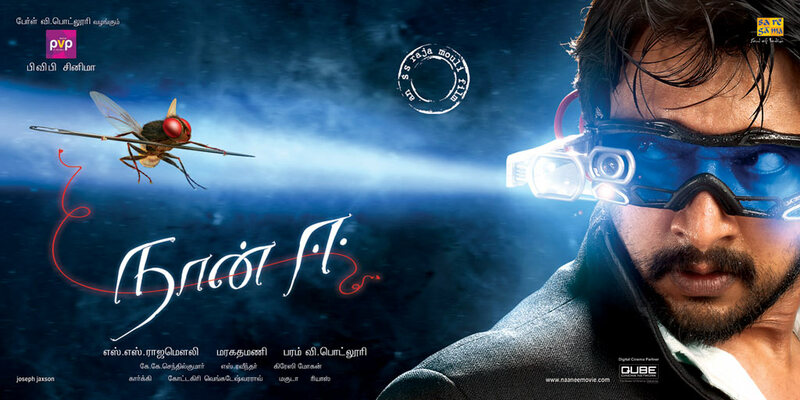 The dead Naani reborn as a Fly and takes revenge on Sudheep.The story is old as a hill, But the execution by Rajamouli is brilliant. Sudheep's character is well sketched by the director, The scene where he kills his own friend for his business, shows us how Cold-blooded his character is and Sudheep played his character with a ease.one can say that he is the show stealer in the movie apart from the cute NaanEe(Fly). Samantha played her part well,her expressions and her Voice( Given by singer Chinmayi) fits the bill.Naani played his small role really well, special applause to him for accepting a character that comes only in First Half. Though Santhanam comes in few scenes,he didn't fail to tickle our funny bones,he is in a great form these days. MM Keeravani's songs and Background score is terrific,Particularly his BGM deserves a special applause.Cinematography in these Kind of films needs special attention and KK Senthil Kumar(Rajamouli's Favorite cinematographer) did a brilliant job. A special Kudos to the VFX team who worked hard to match the CG work to international standards.Crazy Mohan's Dialogues are sharp in serious scenes and brings the roof down in comic portions especially in the romantic sequences between Naani and Samantha. Naan Ee is a Fantasy film in the lines of Finding Nemo, Ratatoulie with Indian Sentiments which is well executed by Rajamouli,Kudos for his honest attempt.Once again he proved that he is a masters in Handling fantasy scripts.